RBL Bank, a mid-sized lender, is a potential takeover target for some larger banks. Not surprising, considering that the bank has been turned around in the last four years by its Managing Director and CEO, Vishwavir Ahuja. "Many," says Ahuja, when asked whether any bank had approached RBL for a friendly merger. 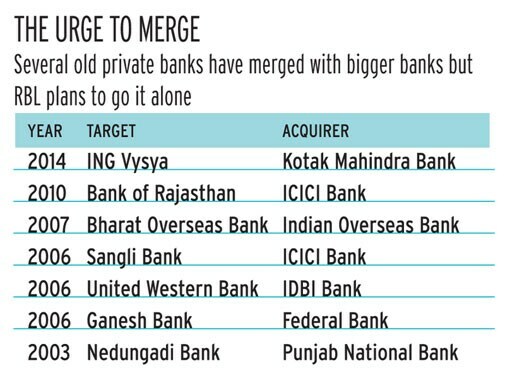 Indeed, several old private-sector banks have been acquired in recent years. Unlike RBL (formerly Ratnakar Bank), the survival of most of them was at stake because of poor operating performance. Ahuja is confident of the future prospects of his bank. "There is no question of any merger," he says. Clearly, the bank, under a new management since June 2010, which includes foreign bankers, is aiming big. In the BT-KPMG study, RBL has emerged as a "Growth Winner" among mid-sized banks. It has a balance sheet size of Rs 18,198 crore and grew its deposits by 39 per cent and advances by 54 per cent in 2013/14. The three-year compound annual growth rate (CAGR) in deposits as well as advances is over 70 per cent. The fee income jumped 110 per cent in 2013/14. The number of branches has jumped from 80 in 2010 to close to 200 now. "We are very much in the interim phase in our long journey," says Ahuja. RBL, under Ahuja, actually went and bought the credit card business of Royal Bank of Scotland in August 2013. In the last four years, Ahuja has revamped the top management, raised capital from marquee names, rebranded its identity as RBL, and launched Internet banking, among other business initiatives. RBL focused on small and medium enterprises when Ahuja took over. The total size of the loan book was just Rs 900 crore and the bank also had a negative return on equity (ROE) in 2010. Today, all its businesses have been expanding at a scorching pace, expanding anywhere between four and 10 times in the past four years. Its loan book is now about Rs 9,835 crore and it has an ROCE of 5.12 per cent. "We want to be a mass-banking institution rather than an urban-centric bank," says Ahuja. The bank already has a presence in 13 states and will expand to 17 states next year and 20 states in 2016. The next trigger for the bank's growth will come from its IPO, according to Ahuja. "We will raise a significant chunk of capital in the near future," he says. But there are challenges ahead. The big private banks, including HDFC Bank and ICICI Bank, are expanding into rural and semi-urban India, a thrust area for RBL. The Reserve Bank of India's new differentiated licensing mechanism will create new payment and small banks focused on rural and semi-urban centres. But Ahuja remains unfazed. "The competitive landscape will definitely change in the future, but there is enough space for everyone," he says.